As the Breckland gives way to the edge of the Fens, the busy Kings Lynn to Thetford Road slices through the landscape, leaving parishes like West Dereham not far off, but feeling strangely lost and remote. The lanes meander and dogleg, cutting down through cushions of fields, and the carstone buildings add a hint of the exotic. There isn't really a village centre, and the church sits near a crossroads with the former Rectory for company. 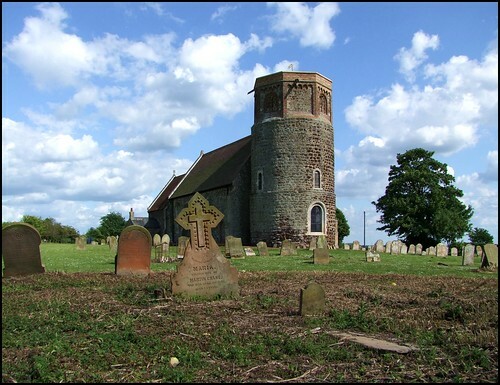 Sometimes everything falls into place aesthetically, and there can be few more beautiful sights in Norfolk than the fat gingerbread tower of St Andrew crowning its wide graveyard. There were once two churches in this graveyard. Mortlock says that fragments of St Peter's church lie hidden in the undergrowth to the west of the present church, which may be true, but we couldn't find them - or any undergrowth for that matter, because there has been a recent careful and rigorous restoration of the graveyard here. One of the fruits of this is a range of rescued headstones leaning against a tombchest by the south porch, including a couple which looked as if they were probably unofficial. Almost everywhere else, such things would have been discarded long ago, and so these are interesting survivals. The south porch itself is elegant and characterful, with one of those Dutch-style gables beloved of the 17th century, but dominating the show is Norfolk's fattest round tower, crowned by a rather blockish octagonal bell stage added right on the eve of the Reformation. You step into an interior which is bright, light and surprisingly large, a wide nave built to scale with the tower. Judging by the tower arch, this must have been a substantial Norman church, but the window tracery now is almost all of almost half a millennium later. Pleasingly, there is something here from just about every century, but the most important medieval survival is a range of glass depicting fragments of the Orders of Angels, including a wonderful head wearing a Pope's triple crown. The piece of a knight holding a sword may well have been part of a donor figure. Despite the backwater character of the parish, the Dereham and Soame families seem to have had plenty of money and enough sophistication to remember themselves with substantial monuments, the best of which is the standing figure of Edmund Soame of 1706. He stands life-size in marble, in a curious combination of armour and wig, and is entirely secular. The eulogy inscribed below makes fascinating reading - Soame was one of King Billy's henchmen in Ireland in the late 17th Century, and went on to travel widely and, as an MP, achieve some influence. The Dereham monuments at least have a reminder of last things; grinning skulls, one winged and the other standing proud of its crossed bones, stare out at us. Another hint of mortality, to me at least, was the box of human remains finding a temporary sanctuary under the altar: I assumed that they had been recovered during the graveyard clearance, and have probably been reburied appropriately by now. Modern iron candelabras with memorial inscriptions hang the length of the nave, a pleasing feature, as is the inscription above the poorbox from the Book of Tobit, reminding us to be merciful after thy power, if thou hast much give plenteously, if thou hast little do thy diligence gladly to give of that little. There was an Abbey in medieval times, not far off. It was founded by Hubert Walter, who was born in the parish. The name will be familiar to those of a certain age, for, as Arthur Mee recalled, he went on to become Richard the Lionheart's favoured Archbishop of Canterbury after they had crusaded together, and in history lessons we were told that he proved a strong prelate who could keep King John in check, when history lessons still taught such things, and they were thought important.